Roof opens at 8P & 10P. Co-presented by Fusebox Festival. Mark Mothersbaugh, creative polymath and founder of the band DEVO, will play orchestral renditions of DEVO covers and his compositions for numerous films, joined by a local musical ensemble led by Graham Reynolds. 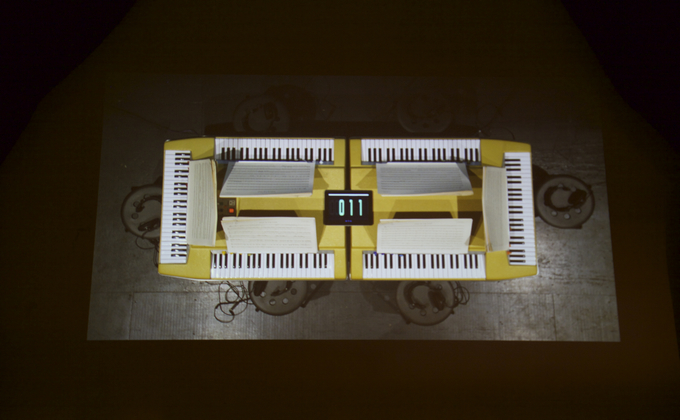 Mothersbaugh will also conduct the performance on a six-sided keyboard that he invented. A moderated dialogue with Mothersbaugh about the exhibition Myopia and his creative process will accompany both performances. Local Players: Corey Dargel, Patryce King, Dave Madden, Charlie Magnone, Artina McCain, Cassie Shankman. Local players coordinated by Graham Reynolds.